Now that we have experienced nine episodes of Twin Peaks: The Return, various patterns linking the new series’ relationship to the original are beginning to emerge. This new show more rigorously alternates between visionary experimental segments, as in last week’s astonishing, “Gotta Light,” and the folksy comedy styling of “The Adventures of Dougie and Janey-E Jones.” This postmodern juxtaposition of high drama and low comedy, in virtually equal proportions, differs significantly from the original Twin Peaks, wherein Agent Dale Cooper’s Tibetan visions strike a marked contrast from the dozens of episodes of conventional television. However, it is another pattern that I have noticed that helps to clarify last week’s episode nine of Twin Peaks: The Return. 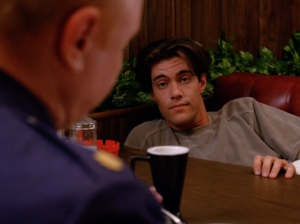 The episode, “This is the Chair,” focuses surprisingly on Bobby Briggs, a minor character from the original series. As a teenager, Bobby was a ne’er-do-well, dealing cocaine for criminal, Leo Johnson, while having an adulterous affair with his wife, Shelley. 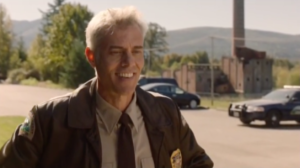 Bobby really mattered to the show only once, when his father, Major Garland Briggs, working on a classified government project, somehow related to space aliens and/or the quest for the Black Lodge, seemingly by happenstance speaks with his son, Bobby. This earlier conversation, which also takes place in Twin Peaks’ ninth episode, “May the Giant Be With You,” makes me suspect that the new show is reworking the earlier show in complex ways, not just extending the story into the future, as we might expect of a new season of conventional television. 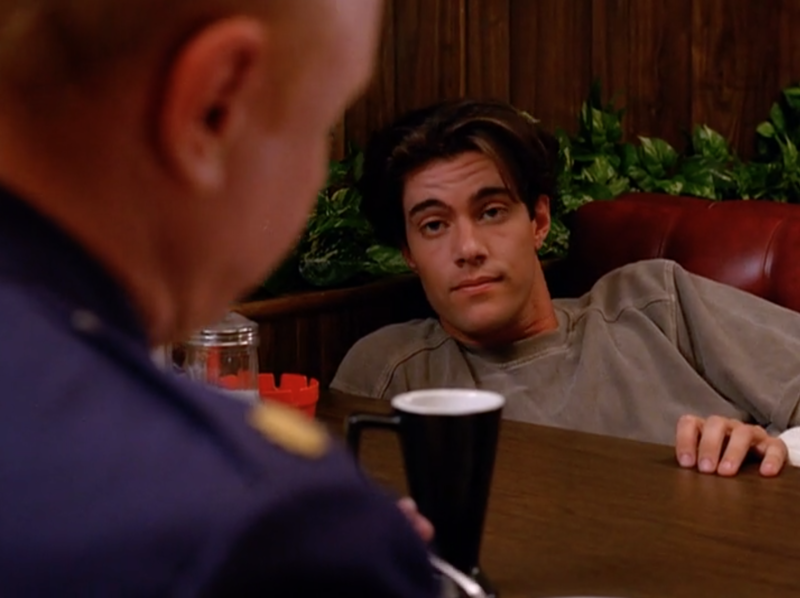 The conversation between Major Briggs and teenage Bobby is one of the most moving segments of 1990s American television. 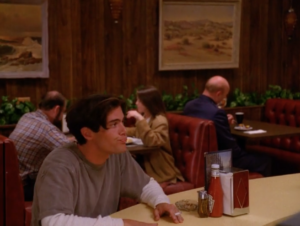 In long shot, we see Bobby sit down in the foreground of the image, at the diner’s counter. He is oblivious to the fact that his father is seated in the background, in a booth behind him. Major Briggs notices his son, and turns to ask him to join him. A surly teenager to his core, Bobby slouches over to his father and dumps his body into the booth. They proceed to have a banal conversation, yet one that I’ve had with my children hundreds of times: “How was school today? School… Fine. That’s good. How was work? Work? Work was good.” The beginning of the sequence wonderfully captures the attempt parents make at connecting with their children. Like most of us, Major Briggs seems to fail, utterly. This is the futile mission of parenting, attempting to keep contact with one’s children, to keep them in your intellectual and spiritual orbit, to guide them to a successful, productive, and contented future. After this apparent stalemate, Major Briggs delivers an emotional atomic bomb, a monologue of epic poetry: He speaks of “A vision I had in my sleep last night… This was a vision, an impression as clear as a mountain stream. 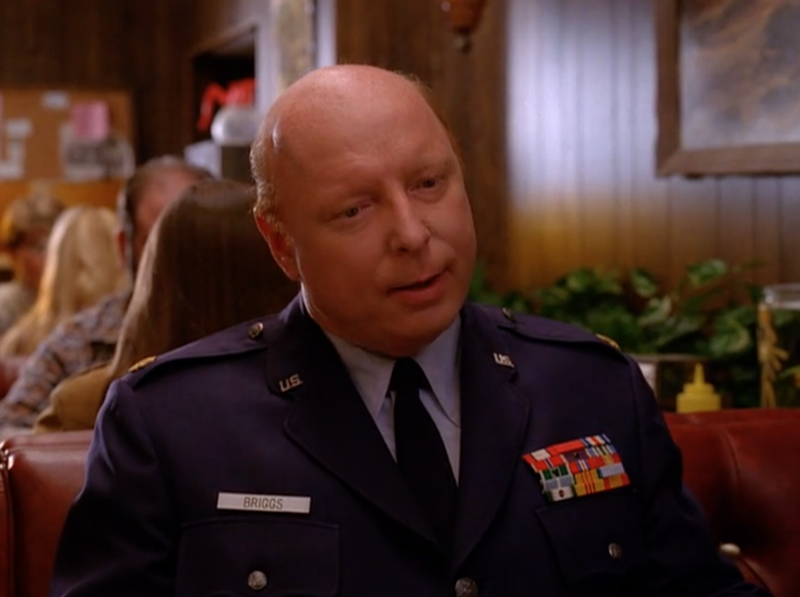 The mind revealing itself to itself.” As Major Briggs describes arriving at his childhood home, Angelo Badalamenti’s Romantic score slowly and quietly builds behind actor Don S. Davis’ moving baritone voice: “This was my first return, a reunion with the deepest wellsprings of my being. Returning to the house’s grand foyer, there came a knock at the door. My son was standing there. He was happy and carefree, clearly living a life of deep harmony and joy. We embraced, a warm and loving embrace, nothing withheld. We were in this moment, one. My vision ended. I awoke with a tremendous feeling of optimism and confidence in you and your future. That was my vision of you.” Up until this point in the show, Bobby has successfully performed the role of disaffected teenager, pretending to be a hardened compatriot of Leo Johnson, terrorizing the sensitive James. But with his father in the diner, Bobby whimpers like an infant. 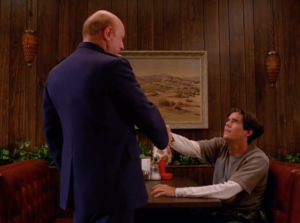 Major Briggs stands up and shakes his son’s hand, concluding: “I wish you nothing but the very best in all things.” After Major Briggs leaves the diner, Bobby sobs, holding his head in his hand, forced to confront the error of his ways, dishonoring such a father with his philandering and criminal behavior. The sequence serves as a synecdoche for the parent-child relationship. Major Briggs knows that all he can do is provide his son the penumbra of protection, modeling for him what is right in the world. It is then up to Bobby to choose his path. Major Briggs will shortly disappear, abducted by space aliens or absorbed by the Black Lodge, we don’t quite know for sure; either way, we can see this as penance of sorts, for his son’s sins, perhaps. 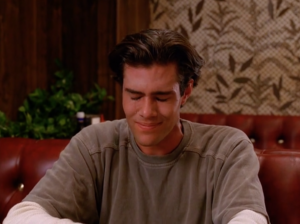 As the original Twin Peaks ends, we believe Bobby to have been lost to the forces of darkness, like his girlfriend Laura Palmer before him, consumed by evil. 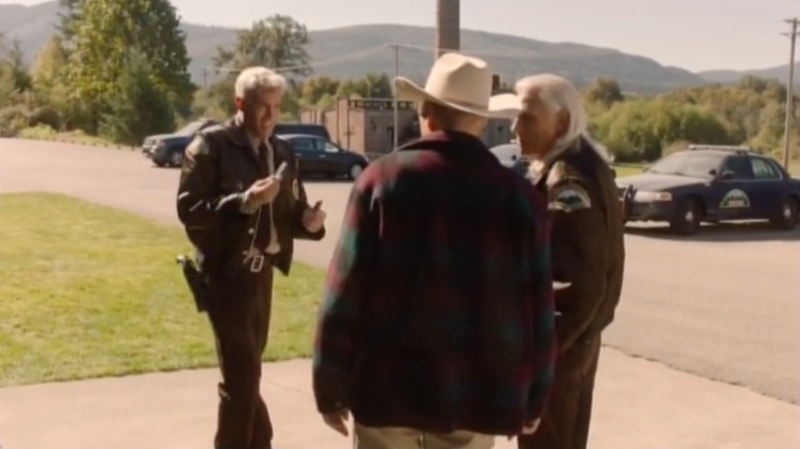 However, as Twin Peaks: The Return begins, we revisit Bobby, now a deputy in the Twin Peaks Sheriff’s Department. As predicted in the Major’s vision, Bobby’s father’s love and belief in him has served to turn the tide in the teenager’s life. He has traversed the unexpected path from drug dealer to officer of the law. Episode nine of Twin Peaks: The Return demonstrates the cosmic significance of Bobby’s embrace of goodness. The corpse of his father has been discovered, decapitated. 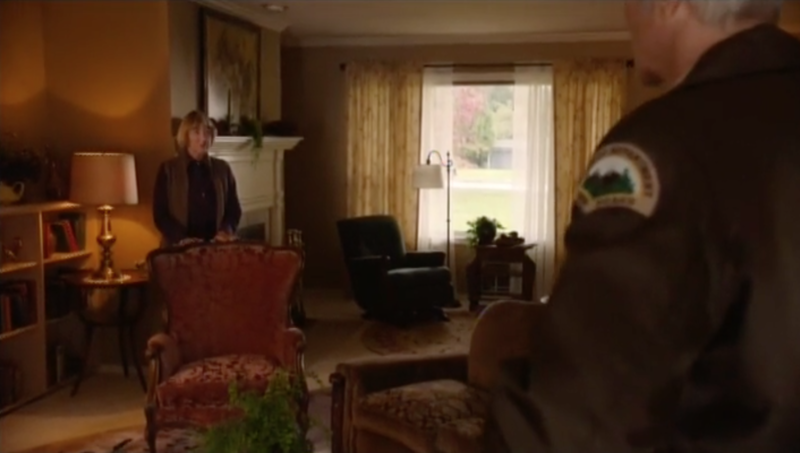 Bobby accompanies the sheriff and Deputy Hawk to the Briggs household, to ask his mother what she might know about the whereabouts of Dale Cooper. Before they can even ask one question, Betty Briggs tells them that twenty-five years ago, her husband informed her that this day would come. Identifying a totem of Major Briggs, the place at the hearth where he sat—“this is the chair”— Mrs. Briggs reveals a secret compartment which holds a small metallic cylinder. The lawmen attempt to open the mysterious object. Bobby says that he knows how, that he was taught by his father. 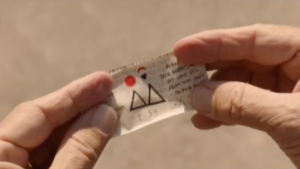 Bobby slams the object onto the asphalt, listens to its tone (as if it is some sort of cosmic tuning fork), and then hurls it again toward the ground. 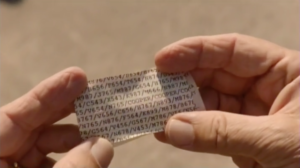 It suddenly opens, revealing a treasure map, directions leading away from Jack Rabbits’ Palace, we assume towards the Black Lodge: another paper has the words Cooper written twice in between what appears to be telemetry from a radio telescope. Having studied Major Briggs’ vision–much like the rabid fans of Twin Peaks–Bobby knows this is the path they must follow. Out on walks with his father, Bobby named that place in the Pacific Northwest woods, Jack Rabbits’ Palace. Identified by Agent Cooper as the space of the White and Black Lodge, Bobby knows it to be a place of deeper significance, the source of his being, the palazzo from his father’s vision. Amidst all of the grandiose mythology about space aliens, David Lynch has once again delivered the emotional goods. A minor character from Twin Peaks has allowed us to explore a major truth, that good parenting matters, it gives birth to the next generation, with greater promise than our own.